Designing a website requires some basic steps to start and then you get creative. When building a school website, I recommend teachers follow these steps. To take a look at what this simple page can look like click here. 1. Request a website space through the SSRSB website. You will receive a username and password for the site. 2. Locate the site using Internet Explorer. Mine is http://ssrsbstaff.ednet.ns.ca/aaront . Your site will be located at http://ssrsbstaff.ednet.ns.ca/plus your username. 3. Go to file - edit with Microsoft Office Frontpage. If this is not the edit program you will need to change it to frontpage. To do this, in Internet Explorer, go to tools - internet options - programs - html editor - click the arrow and select Microsoft Frontpage and click OK.
4. 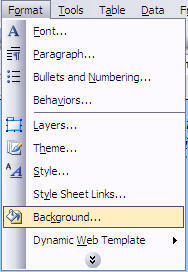 Now you should be able to go to file - select edit with Microsoft Office Frontpage. 5. We design a website for a reason. It may be to post homework for students, promote something at your school, or a combination of reasons. We also need to decide what it is going to look like when it is finished. 6. 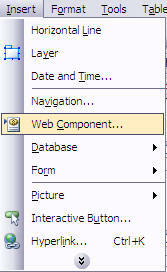 If you want a simple website select from the menu and a new page will appear. On the right side of the screen there should be a table layout menu with a number of different possible designs. Select one of the layouts that you want to use. It will place the table in the new page. 7. I like the layout. It allow me to place a graphic in the upper left corner. The title of the page in the top right side. I place the link buttons in the left column and a table of information in the lower right cell. To see this style page click on the following table layout. 8. To place an interactive web button on your page, click in the location you want the button to appear, go to insert - web Component - select interactive button from the right side. 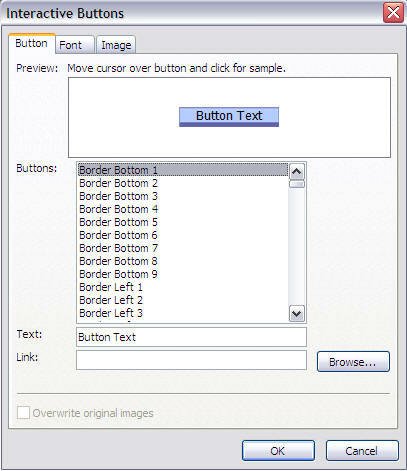 It will show a window with the possible styles of buttons. Scroll through the list to find the one you would like to use. Change the text to what you you want for the button text. Browse to find the page you wish the button to link to. If it is an external website, use internet explorer to locate the site, copy and paste the URL (web address) of the site into the link line. Click OK and safe the changes. 9. This is a simple website that you can now change to fit your needs. 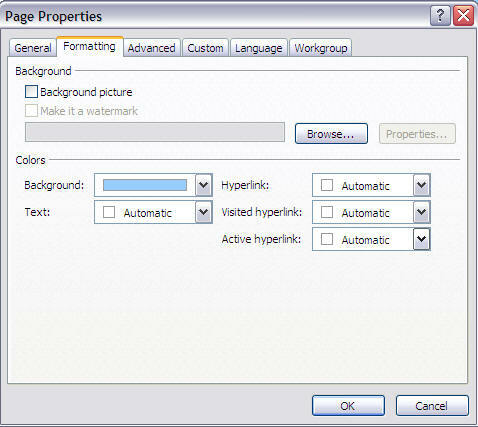 To change the background color go to format - background - a window appears - click the arrow beside background - and either select a new color or select more colors to get more choices. 10. Have fun a try some different styles. Insert some pictures and tables to learn how to format your page. After some practice, I believe you will find building and editing a website is as easy as writing any document.